Daemonite Justin has been beavering away on a pet project for many moons. It's pretty special. Modify existing content types or build them from scratch. Put content types together visually with a drag'n'drop from the Formtools Palette. Marvel at the beautifully formatted code written for you. 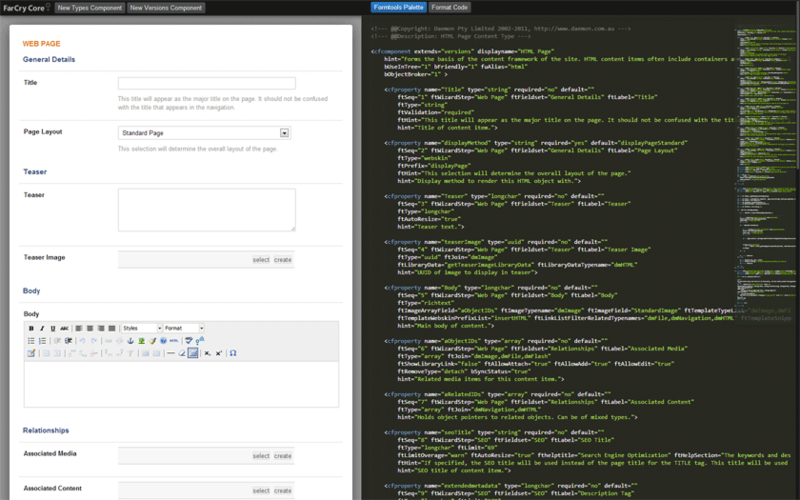 Or if you prefer, code away and see the content type visualised in real time. FarCry Builder supports nearly all the standard formtools, fieldsets and wizard steps, plus a bunch of common formtool combinations like image cropping.